Everybody knows that I’m a Small Town Girl, despite the fact that I live in the biggest city in South Africa. (This actually came as news to me when I did a quick search on that … Cape Town is the biggest, population-wise, followed by Durban, and then only Jozi! As Joe always used to say Ex Africa semper aliquid novi.) Anyway, back to the point … my Small Townism and its view on London. Well, my view on London is this: it is an incredible city with the most enormous number of things to do, places to see, people to meet, and my The Weatherman was so kind to me and kept the sky blue and the sun shining, yet my African blood gets nervous and my African heart gets claustrophobic and I find myself thinking that everybody on those streets of London is just having such a hard time of keeping up and it makes me sad and leaves me feeling entirely drained. Cue: my friends. So many of them that live and love in London, and love it and thrive, which is why on day two in that bustling city I met a bunch of them in Greenwich at The Old Brewery (perfect accessibility), watched over by the huge trees (another thing that will keep me loving London) of the park and side-eyed by the Cutty Sark, and it was wonderful. Friends from forever ago and friends from more recently and even some new friends, a beautiful hound called Paloma and a surprise pop-in by wonderful family friends made for a day so filled with joy and loveliness and love, that I felt entirely refreshed. 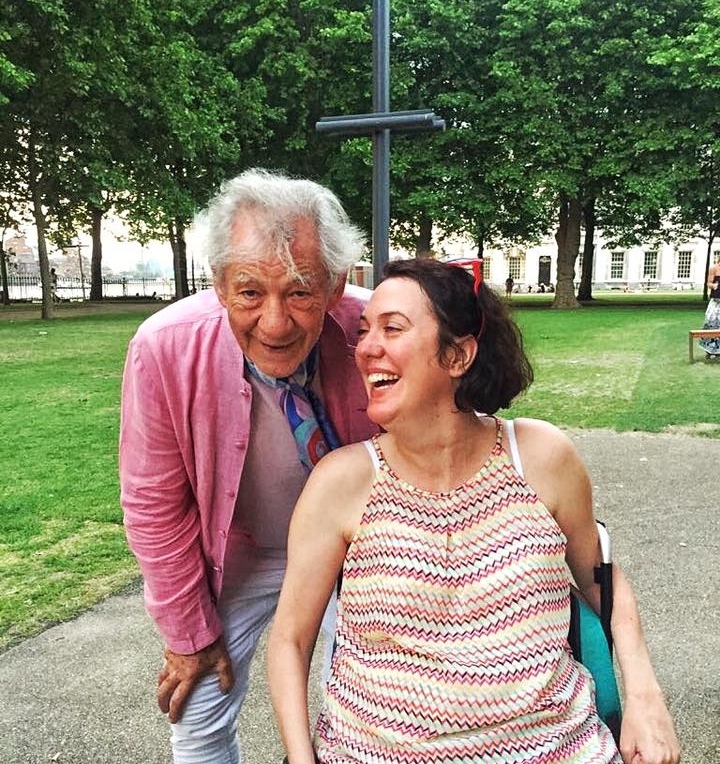 Oh, and I met a knight – Sir Ian McKellan, or Gandalf, as I like to think of him – which was pretty bloody marvellous. He was just lovely. Also marvellous – being able to hop on a bus (the right way around, this time) and get home safely and easily. The next day we braaied under the hot London sky (yip!) and frolicked in the ‘hot tub’ – set on cool due to extreme heat – with one of my oldest friends (and hostess with the mostest) and her lovely neighbour. Perfect, lazy, Sunday. Then Gogglebox … GOGGLEBOX! It’s brilliant. Voyeurism to the max. Travelling stories and pics will resume with the next blog – to Sicily we go! This entry was posted in Accessibility, Family & Such Creatures, Food & Drink, Travel & Exploring and tagged Europe '17, friends, London, Old friends. Bookmark the permalink.